Just how many vehicle agencies can there be? We've learned a lot about the various VOSA/DVLA/VCA people and which bits apply and which bits don't. This is just what we've done, your mileage may vary, and it most definitely isn't legal advice. Our principle is - it's one thing for the police to ignore you, it's another when your insurance company (who you've only paid £150 to!) don't want to pay up for that nice BMW you just "scratched". A lot can be done from home, you'll need to work out your local DVLA office. Offices vary from having a 90 minute wait to being straight in and out. A lot can be done with printed forms and the post. This all applies to vehicles over 3500KG that don't work for a living, and cars are different. - Age! The get out of gaol free card "Motor vehicles first used before 1st January 1960, used unladen and not drawing a laden trailer, and trailers manufactured before 1st January 1960 and used unladen." - you really want to be unladen? You can get a guess how old your 404 is from the bottom of the Rocky Mountain Moggers reference page. Tax exempt (if before 01/01/1973). - Run round as a tractor - not that legal. An Agricultural Motor Vehicle (AMV) is classified as a vehicle “which is constructed or adapted for the purpose of agriculture, horticulture or forestry and which is only used for one or more of those purposes. " from VOSA. 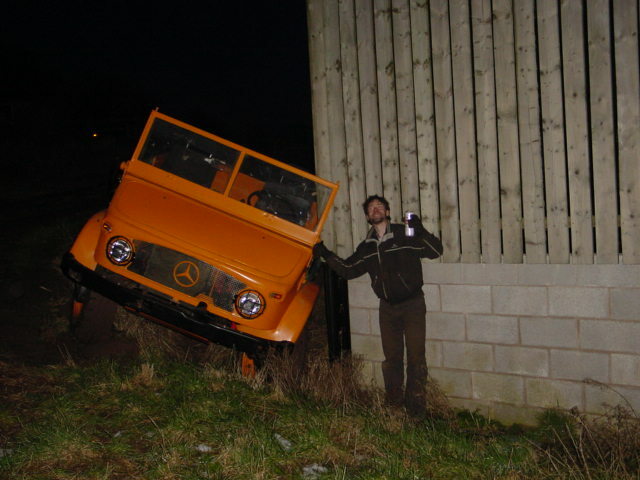 It being a Unimog is not good enough - and your "friendly" insurance company knows it. You also can't go on motorways if you can't do 50. Tax exempt as well. 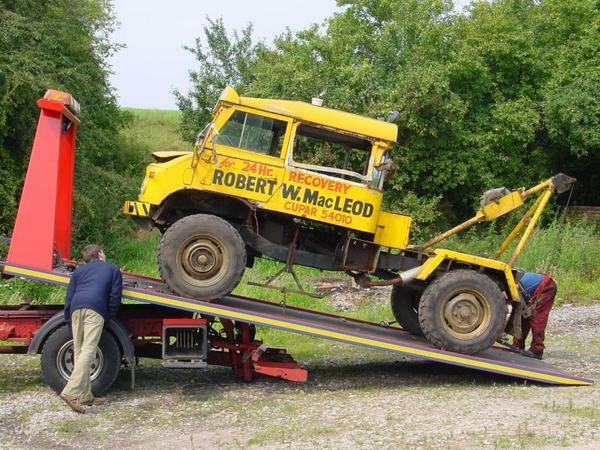 - Recovery vehicle. Recovery vehicles (and "Mobile cranes") seem to be classified by what they are, not what they do. 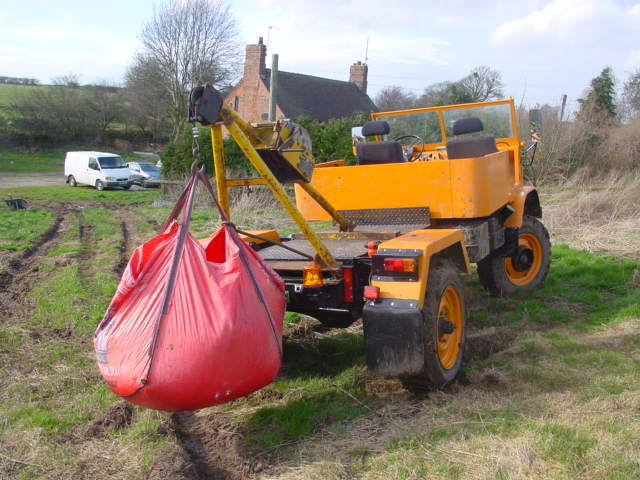 I have an email from VOSA stating "'break-down' vehicle means a motor vehicle on which is permanently mounted apparatus designed for raising one disabled vehicle partly from the ground and for drawing that vehicle when so raised; and which is not equipped to carry any load other than articles required for the operation of, or in connection with, that apparatus or for repairing disabled vehicles; Breakdown Vehicle (over 3500kgs)which are lift and tow only, with no room to carry goods or burden are exempt.". - Our harvey frost crane fits. We started off with an indeterminate aged 404 with a Q plate and no paperwork at all. First off - get a form V62 to get a new logbook (V5C) and see what comes back. Hopefully nothing bad will happen (like the old owner reclaims it, it's been nicked/written off - that sort of thing). If you want to get it "properly" registered, then you need to prove how old it is. There are some clubs who can do this, allegedly. 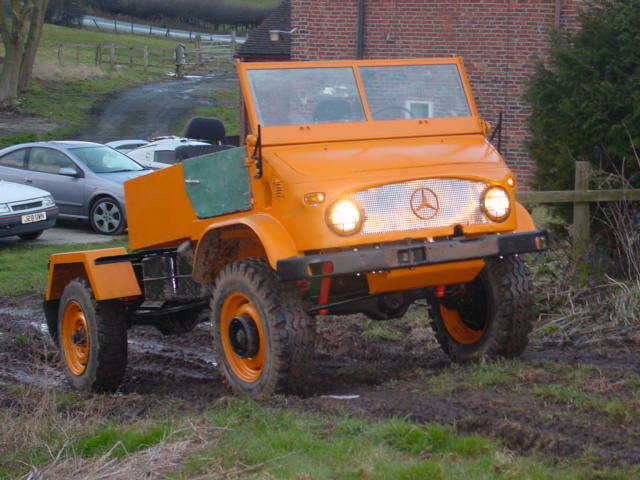 I was prompted to call Ma Benz UK Unimog Sales and eventually got an age certificate from them. They probably won't know the 404 records are not on the computer ("no, that really _IS_ the chassis number") and they will have to call Ma Benz Germany for them to copy the paper records. Then you you're ready for the test (if you need tax, see below). The big scary HGV test and "plating"
First thing is, find your Local VOSA Test Station and go and talk to them, our lot were nice. A "plate" is a two part, laminated certificate of weight, class and type. One bit goes on the truck, one bit gets waived about when needed. The MOT is a normal paper certificate, you need the plate to get the MOT. You have to book the test through VOSA head office, not the station. There's two different forms - VTG1 - First MOT (you get the plate) and a VTG 40 - Normal MOT when you have a plate. The testers quite liked the mog, it's so damn simple it's easy to do. Watch them automatically pull the diesel gas tester, thrill as you switch the engine off during the brake tests. 404 brakes will easily pass if reasonably adjusted and similar. Leaking output seals will make them too bad (ask me how I know!). I'm not too sure about this (as we fitted comletely new lights anyway), but the stock 404 lights may not pass. You will need a fog light, but not a reversing one. Brake and sides must be separate. Be nice to them, and make sure they know it's for recreational use. Everything has to have a tax disc, even if it's free. You can check what they think of you at vehiclelicence.gov.uk - click "Vehicle Enquiry". There's can be a field called "Date of Liability" (or something). This is when they last think you should have paid them something. Ours was 5 years ago, but it didn't seem to matter. You can see about the different Tax Exemptions available, the tractor exemption is the same as for MOT. Tax is free for non commercial use for everything constructed before 1 January 1973. T'other thing you can do is drop the weight classification. Certain companies can issue a plate (for ~£250) that defines it as being less than 3500KG max gross weight. A stock 404 troop carrier weights about 2900KG, I couldn't deal with that - normal max weight is 4750KG. Lots of camping gear, some wood, tools and a few fat mates and you're overweight.